Food Truck First Impressions (Tips & Tricks) – Food Truck Talk – Searching for the best foodtrucks! Brian Sacks of MobileFoodProfits.com addresses the appearance of your new mobile food truck. He reminds us that first impressions are important! If there is one sure way to kill your Mobile Restaurant it’s not having it properly painted or wrapped. You see many are still skeptical eating “street food.” I am amazed to see owners spend money on a vehicle and equipment only to scrimp and be cheap when it comes to the truck’s appearance. Yes, I know that sounds cliché and it is. But that doesn’t mean it’s not true. People will see your vehicle and in 5 seconds decide if they are comfortable eating your food. It doesn’t matter how good it is! It only matters what they see. You can either have your truck painted or wrapped. I prefer wrapping the truck. Your investment would be 1000-3000 for the paint option and about 3000-5000 for a decent wrap. You should try to use catchy hot or neon type colors so they “pop” when people see you coming. One of the little secrets I discovered was to actually wrap the roof as well. When I first mentioned it everyone thought I was crazy. But think about it for a second. THERE ARE A FEW OTHER WAYS TO MAKE YOUR MOBILE RESTAURANT APPEALING! One of the ways we found to this was to add outside stereo music, lights and an awning. You really want to have that party atmosphere going so people are attracted. In our case , since we are Mexican Mobile Restaurant, we are playing Mexican music and at night our outside bright lights are on creating that party atmosphere, and besides that of course you need your food to be good, one of the best ways to achieve this is by adding good quality equipment like the iron mountain refrigeration & equipment to keep your food fresh. 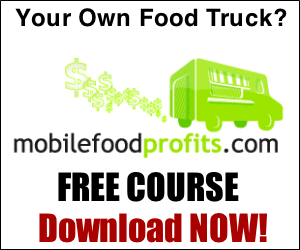 Brian Sacks is the president of Juana Burrito and www.mobilefoodprofits.com He offers consulting services as well as a complete paint by number course on how to profit from the biggest niche to ever hit the food industry at www.mobilefoodprofits.com. Is Winter The Best Time To Open A New Food Truck?